I no longer remember when some teacher first exposed me to the works of Elmer Rice. I do recall a photocopied version of The Adding Machine stapled together in over-sized glory. The quality was what you might expect from school office machines. I had never read anything like it. August Strindberg is credited with bringing Expressionism from the visual art medium to the stage. Rice’s book, which I quote above, does a wonderful job discussing American theatre and how it got to where it was around 1960. The wide-ranging knowledge and understanding of all aspects of his chosen field brings into sharp focus the necessity of any artist to fully study their craft, their business, and their history. With the accretion of experience and time, I now see the interesting place that Rice holds in the history of American theater. 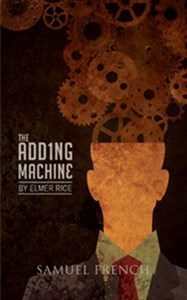 Street Scene, his Pulitzer Prize winning follow-up to The Adding Machine, is another acknowledged classic. (We can talk more about that when we get around to Kurt Weill.) Rice’s most notable contemporary was Eugene O’Neill, who was also breaking theatrical conventions, while pursuing a more self-destructive lifestyle. both Our Town and Death of a Salesman, two plays which appear to owe great debts to their predecessor. The structure and approach of Our Town is brilliant and appears fully traceable from Strindberg to Wilder through Rice. Each step feels like an experiment in finding the right mix of concrete and abstract. On the other hand, the commonality between The Adding Machine and Death of a Salesman comes in the subject matter and sympathy for the trials and tribulations of the American worker. Rice includes the bigotry of his times while Miller explores the moral ambiguity that had come to define corporate life. Critics hailed Miller for creating the tragedy of the common man. It is clear that Rice had arrived there a couple decades sooner. He found it to be an existential tragedy more than familial. Perhaps that is why The Adding Machine hit home at the time I first read it. Our stories that portray existential crises tend to move fairly quickly into spiritual and mystical matters. While comfort can be found in those arenas, they also present easy answers for artists to reference with shared tropes. Rice’s most significant accomplishment may be taking those tropes and showing that they do not provide uplift. They are a shyster’s game. You’ve Got to Check This Out is a blog series about music, words, and all sorts of artistic matters. It started with an explanation. 226 more to go.